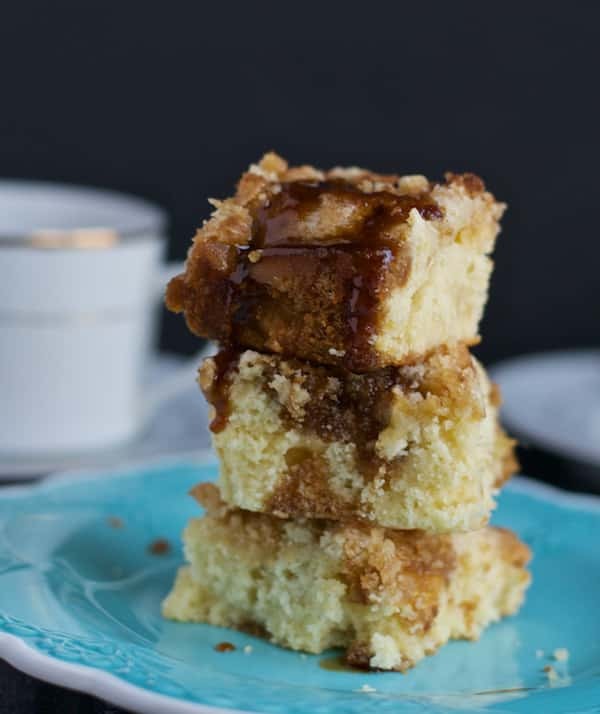 Apple coffee cake with brown sugar glaze is a moist and crumbly coffee cake drizzled with glaze and loaded with apples. It is a perfect excuse to eat cake for breakfast. This is my first time baking a cake with crumbled topping. We all know crumbled cakes are the best!! It turned out to be delicious – perfectly moist and crumbly. My husband who does not have much of a sweet tooth loved it! It is also my official entry for the Sweet Southern Desserts Recipe contest. This contest is sponsored by Dixie Crystals and Blog Life University Conference. Why should you be excited about this cake? This recipe is straightforward and easy to make. Takes only 40 minutes or less!. It is a perfect excuse to eat cake for breakfast. Of all the reasons, the last one is my favorite. I would love to know what’s your reason to make this cake and also, how it turned out when you made it. Can’t wait to hear about it in the comments. One last thing, you can skip the glaze if you are trying to cut calories but every now and then, we all deserve a delicious treat. Don’t we? Preheat oven to 400 degrees F. Grease a 9-inch square pan with butter and set it aside. In a large bowl, whisk the beaten egg, milk, butter till they are well combined. In another bowl, combine the dry ingredients - flour, salt, sugar, and baking powder. Add the dry ingredients and the apples to the wet ingredients and mix them till they are well combined. Pour the batter into the greased pan. In another bowl combine flour,sugar, and butter to make the crumble topping. Sprinkle this crumble topping evenly over the batter. Place the pan in the preheated oven and bake for 25-30 minutes or until a toothpick inserted in the center of the cake comes out clean. 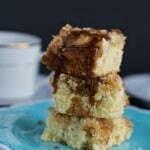 Make the glaze - Combine brown sugar, vanilla extract, and water to make the glaze. Pour the glaze evenly over the cake. Let it harden slightly. Serve the cake warm and store the leftovers in the refrigerator. Seriously…this looks incredible! One of these days I’m making it over near you and coming over for dinner! 🙂 Beautiful photo too!